This newly opened, mid-city Los Angeles pie shop, the brainchild of Kent, a vet of all segments of the food industry, from research, to new product development, to selling pies in the L.A. Farmer’s Market. I was toted over there by Larry the Lawyer, my L.A. eating buddy for nearly 30 years. We regularly hit the new spots when I am in town, and he’s been to Olio several times in their first month, and wanted to share it with me. The menu is brief, but chock-a-block full of interesting and high quality toppings. Kent discussed some of his “secrets” with us in between shuffling food out of the hotter than Death Valley wood-fired blast furnace in which he does his cooking. ”The secret is in my dough, but I’m not telling you the secret.” Kent uses Caputo, as most respectable pie-makers do these days. Caputo is the standard pizza flour in Italy, and you can buy it at gourmet shops or online, in one kilo (2.2 pounds) or 55 pound bags. We wanted to “challenge” Kent, so starting with his basic Margherita, we dared him to use in-house ingredients to make an “all-meat” pie, which he admitted wasn’t one of his favorites, and would not appear on the menu. He had some prosciutto on hand, as well as his house-made chicken Italian, pulled manually in rough chunks, the way I prefer. He added a mountain of a unique cheese blend, popped it in the blast furnace for 6-7 minutes, and out it came, perfect Neapolitan style, bubbly, crispy crust, goody cheese, and adorned with a variety of meat toppings just for us. 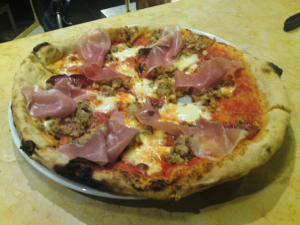 If you love good pizza, you’ll REALLY love this, but order several to try his various creative combinations. Olio is open for breakfast, lunch and dinner, and also does smash-up catering events. We had the intent when we started the evening, to start at Olio and move across the street to check out Pat La Freda’s special meat at Burger Kitchen. But the pizza was so damned good, I didn’t want to cut in on the experience at all. Burgers will have to wait for another day.